How to deal with mosquitoes and other bugs and creepy-crawlies in Tuscany. Insects including mosquitoes plus spiders, ants and scorpions occur commonly throughout Tuscany and not something that the property owners have any control over. Many vacation rentals are in the countryside and part of country life is that insects do exist and will, in all probability, enter the house at some point. Insect screens in windows are quite rare and are usually found only in areas where mosquitoes or flies are plentiful. Some visitors sleep in air conditioned hotels specifically to avoid encountering insects, especially mosquitoes, but for most people they are not a problem when proper precautions are taken. Mosquito nets are usually provided where these insects are a known pest. Click this link for useful information on how to deal with mosquitoes in Tuscany. What is a "villa" in Tuscany? Arrival times, duration of stay and departure times. Electricity, water and natural gas supplies. - Air conditioning in Tuscany. 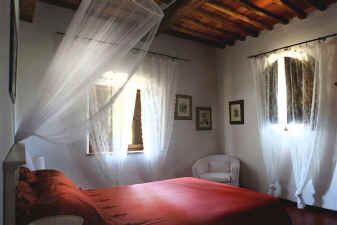 - Heating a vacation rental in Tuscany. - Water supply in Tuscany. Cleaning your Tuscan vacation rental. Food and other Supplies in Tuscany. • Insects, mosquitoes and other "bugs" in Tuscany. Gardens and terraces in Tuscany. Festivals and events in Tuscany. Roads and driving in Tuscany. Tuscany Vacation Rentals Copyright © ammonet InfoTech 2005 - 2018. All rights reserved.